For some in the industry, gluten free is a “tipping point” in the US foodservice channel. For others, operators have caught up with the trend, with many feeling their menus cater for the current level of demand. Dean Best takes the foodservice temperature of what has been a hot category in US retail. In December 2013, the National Restaurant Association, the industry organisation representing the sector in the US, carried out its annual survey of over 1,000 professional chefs to find out the “hottest menu trends” for the year ahead. Gluten-free was fifth in the poll. A year later, the survey, looking at the top trends for 2015, had gluten-free fall seven places to twelfth. However, 6% of respondents – all members of the American Culinary Federation – named gluten-free cuisine as the “hottest menu trend 10 years from now”. The fact it was cited at all as chefs look ahead to 2025 suggests there is a feeling in the industry gluten-free has legs. Some major gluten-free manufacturers agree. “Food service is at a tipping point,” Christine Sacco, CFO at Boulder Brands, told Wall Street analysts last month as the owner of gluten-free brands Udi’s and Glutino reported its financial results for 2014. 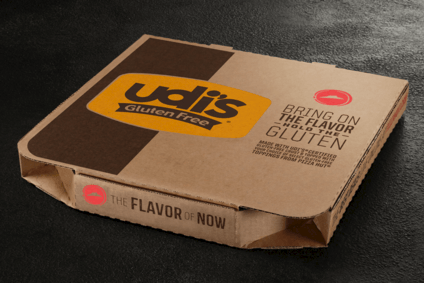 In January, Boulder announced it was taking its Udi’s brand into the US foodservice channel through a tie-up with Pizza Hut. The deal has seen two varieties of gluten-free pizza go on sale at Pizza Hut outlets in the US. “Our recent partnership with Pizza Hut is validation that restaurants and foodservice operators want co-branding with a category leader to be successful in gluten-free,” Sacco told the analysts. Boulder’s work with Pizza Hut has seen it join the likes of Italy-based Dr Schar in supplying pizza products to pizzerias and pizza chains in the US. Both businesses have enjoyed growth in the retail channel on the back of their brands. Building brand awareness in the foodservice sector can be more difficult as, to an extent, brand protectionism comes into play. However, Boulder and Dr Schar have been able to put their brand logos on things like pizza boxes or cards at a table to make pizza lovers aware they are consuming their brands. Boulder is hopeful the tie-up between Udi’s and Pizza Hut can give its brand – already growing in the US retail channel – a further boost. “If you go back in the day when Newman’s Own went into McDonald’s, it kind of put that brand in a whole different orbit, and we hope that over time can happen with Pizza Hut and other related big national food service operators,” Stephen Hughes, Boulder’s CEO, told analysts last month. The gluten-free category has been enjoying growth in the US retail channel of around 40-50% and, even if that rate has eased to around 20% in the last 12 months, it is a business in rude health in grocery stores, as interest from mainstream consumers – those who do not suffer coeliac disease – propels sales. It has, as the moves by the likes of Boulder and Dr Schar testify, made inroad in US foodservice, although not quite at the same pace. And there are some questions about the strength of the outlook for gluten free in foodservice outlets. For George, gluten-free will see growth but not rapid growth in US foodservice. Industry analysts Technomic are also cautious about the prospects for the category in the foodservice channel. David Henkes, a vice president at Technomic, says there has been a “huge explosion” in gluten-free options on menus but puts that down to the interest from “lifestylers” – consumers who do not have coeliac disease – and not down to the small proportion of the US population that needs to buy the products for medical reasons. “Here’s the thing with gluten-free. The number of people in the States that are actual coeliacs is half of one per cent. Most consumers don’t even know what gluten is and what it does to you. Gluten-free is – for many – a lifestyle choice, as opposed to a health and wellness choice. There’s been a huge explosion of gluten free on menus, not necessarily driven by coeliacs but driven by lifestyle choices. The question is: how much more can it really go?” Henkes says. While there is some discussion over the prospects for gluten-free on menus, there are signs among manufacturers of packaged gluten-free products that certain parts of the US foodservice sector will present an opportunity to drive growth. US free-from snack maker Enjoy Life Foods is one such company. Enjoy Life makes products such as biscuits, chocolate and snack bars that are free from allergens including wheat, dairy and peanuts – and it is now owned by Mondelez International. Speaking to just-food last month on the day the deal was announced, Joel Warady, Enjoy Life’s chief sales and marketing officer, put forward foodservice as an avenue in which the company could build on its recent healthy top-line growth in retail stores. “We are present in foodservice but in a very small way,” Warady said. “However, we get requests on a regular basis for foodservice. One of things we have seen over the last 12 months is the demand in whether it’s universities and colleges or hospitals or sporting venues. They’re all looking for a free-from solution that’s in individual packs so there’s no cross-contamination. Our business continues to grow in those channels so we’re definitely going to be adding focus to the foodservice area. George agrees there is “absolutely” an opportunity for gluten-free snack products in the foodservice arena. “Portion-packed cookies for school lunches and for healthcare, crackers, single-serve rolls, bagels. It really does cover the gamut. Another growing area is universities as you have students going to school that have to eat gluten-free or prefer it. There’s enough companies out there that offer an assortment,” she says. Gluten free has proved one of the hot categories in the US food industry in recent years and, while there is some debate over the strength of the sector’s prospects in foodservice, there is confidence among suppliers of further growth.